Assistant Commissioner, Food Safety Jammu, Dr Parvesh Kumar, briefing Anganwari workers about food safety measures. 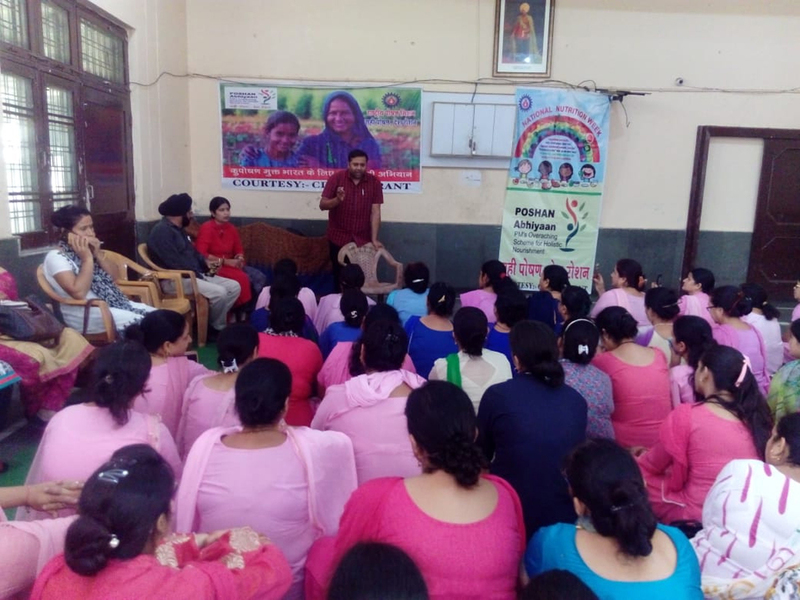 JAMMU, Sept 11: Food Safety wing of Drug and Food Control Organization, Jammu today organized a one-day awareness camp at Ved Mandir, Amphalla, Jammu for the Anganwari workers and helpers. The camp was organized by Dr Pravesh Kumar, Assistant Commissioner, Food Safety Jammu under the overall supervision of Commissioner Food Safety, J&K. A large number of anganwari workers and helpers drawn from various ICDS Migrant centres of Jammu under the supervision of CDPO Neha Gupta participated in the camp. The workers of ICDS centers were briefed about proper ways of storage and cooking of food articles, safe handling of equipments, utensils and proper way of washing their hands before cooking and serving meals to the children. They were also taught various ways of maintaining hygiene while cooking food for the children to prevent the cross contamination and infections among the children. The occasion was also attended by Food Safety Officers, Dileep Singh, Renu Bharti and Supervisors of ICDS centres. Meanwhile, a Food Safety team paid surprise visits to ICDS centers Karan Nagar and Roop Nagar and lifted samples of food items like Gram, Oil, Rice, pulses, etc, and sent the same to Food Testing Laboratory, Patoli for analysis. The team directed anganwari workers of ICDS centres Karan Nagar and Roop Nagar not to distribute the food items among children till the outcome of the laboratory report.